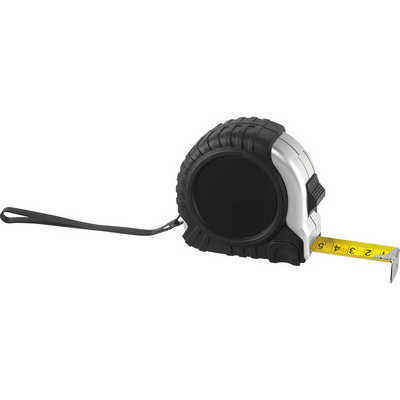 Description: The Pro Locking tape measure includes a 7.5 meter retractable tape measure with standard and metric measurments, a rubber casing, a rubberised wrist strap and metal belt clip. The side locking button locks the tape in place. Features: Packaging:. Colour: Silver Material: Product Size: 80mm(w) x 80mm(h) x 45mm(d). Freight details : 30 per carton, 13kgs, 47 x 32 x 11cms; Decoration Type(s): Colour Print / Full Colour Print. Decoration Area: Print: 35mm �. Price includes : 1 Colour Print. Setup is included.